A meeting of the Kurdistan Democratic Party of Syria in Darna town. Credit: Karlos Zurutuza/IPS. QAMISHLI, Sep 17 2012 (IPS) - Over a yellowish map, Qehreman Meri draws an oblong surface along the Turkish-Syrian border. “We want an autonomous region with clearly defined boundaries,” says this spokesman from Yeketi (Unity), one of 15 Kurdish political parties in Syria. “Of course there are differences between us, but we all stand together so our revolution is not stolen by foreign actors,” says the activist. Many people believe that Arab countries and Jihadist organisations are backing the Free Syrian Army, the main Syrian opposition armed group. Widespread uncertainty over the FSA’s agenda for the region is causing growing concern among the local Kurds. “We have nothing against them, but they must stick to their area,” Meri says. Founded in 2000, Yeketi is one of 15 political parties within the Kurdish National Congress (KNC). Masoud Barzani, president of the Autonomous Kurdish region in neighbouring Iraq, sponsored its creation in October 2011, in the wake of the war scenario in Syria. Last July, and also under Barzani’s direction, the coalition reached an agreement with the dominant Kurdish political force in Syria, the Democratic Union Party (PYD), to set up the Kurdish Supreme Committee. Today, most Syrian Kurds remain under its umbrella. Azadi (“Freedom”) also follows suit. Majid Hanush, executive leader of this party founded in 2005, agrees on the need for unity towards building a Kurdish autonomous region within a Syrian federal state. “The Kurds deserve it more than anyone else because we are the main victims of the Sykes-Picot treaty,” says Hanush from his home in Darna in the northeast corner of Syria, five kilometres from the Turkish border. The activist refers to the agreement signed in 1916 by France and Britain that lead to partition of the Ottoman Empire and the division of the Middle East into the still existing borders. Numbering around 40 million people, the Kurds are the largest stateless ethnic group in the world today. About half are in Turkey, large numbers in Iraq and about two to four million in Syria. Like most local dissidents, Hassan Syfaldin has endured imprisonment. He claims to have worked for over ten years for the Kurdish Democratic Progressive Party of Syria (PDPKS), but he disagrees with his colleagues on the formula to achieve long awaited rights. “Dividing Syria into autonomous regions would lead to a similar scenario to that in Iraq, or even worse,” says Syfaldin from the party’s newly opened headquarters in Girke Lege town, 700 kilometres northeast of Damascus. He calls for “building bridges to reach everybody, even outside the Syrian borders.” He refers to the support they have historically received from the Patriotic Union of Kurdistan, one of the two main political parties in the Iraqi Kurdish Region whose historical leader, Jalal Talabani, is also Iraq’s president since 2005. 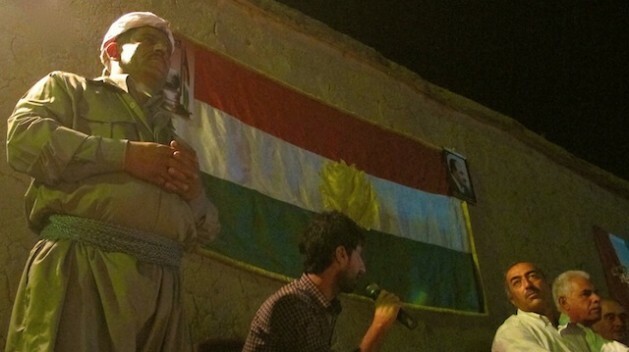 “We survived a brutal regime – the Assads – but, today the Kurdish revolution must be done by and for the Kurds,” Ismail Ali Sheref, local leader of the Kurdistan Democratic Party of Syria (PDKS) tells a large crowd in the small town Darna, standing before a portrait of Mustafa Barzani, father of the current president of the Autonomous Kurdish region of Iraq, Massoud Barzani. Several villages in the northeast of the country are for the present under Kurdish control after a series of protests last July. Many like Sheref think this new scenario is the “clear outcome” of a secret truce between the PYD and Syrian President Basher Al Assad. In the border city Qamishli, 680 kilometres northeast of Damascus, PYD chairman Salih Muslim strongly denies such claims. “Damascus knows we just want our constitutional rights, that is why they’re not afraid of us,” Muslim tells IPS. “We knew Assad would not fall in just two months, so we organised our people into civilian defence committees long ago. Actually, we already had some checkpoints a year ago and the government simply couldn’t do anything about it,” adds Salih Muslim, Syrian Kurdistan’s most prominent leader. Turkey has repeatedly expressed concern over the growing influence the PYD has in the region. Ankara sees evidence of links between them and the Kurdistan Workers Party (PKK) operating within Turkey. Despite the PYD’s apparently humble demands, analysts do not rule out a possible Turkish military operation in the area, or even Turkey funnelling FSA fighters to the region to quell the Kurds’ self rule. The Organisation for a New Kurdish Society, set up in the heat of the revolt against Assad, strongly rejects such a hypothesis. “We’re waiting for our Syrian brothers from the FSA to come and help us liberate our area,” says executive member Bave Sipan. Sipan says they have no contact with the PYD, while he talks about a “fluent communication” with the FSA. Unsurprisingly, his residence is the only place in the region where this IPS correspondent spotted the Syrian rebels’ flag: black, white and green stripes with two red stars in the centre. “The future of Syria is a federal state divided in four autonomous regions: Sunni Arab, Kurdish, Alawite and Druze,” says Sipan. Azad, a friend of the family, joins the conversation. This 38-year-old oil worker and a member of Avahi (Reconstruction) – a civil organisation “committed with Syria’s Kurdish society” – disagrees with his host.